After spending most of this year on landscapes I've been wanting to take a break and try something different. I finally came around to the idea of doing some still life projects. They're a good way to develop a whole slew of painting techniques, all while working from life. Since I've done very few still life works, I'm expecting this to be something of a rocky ride. 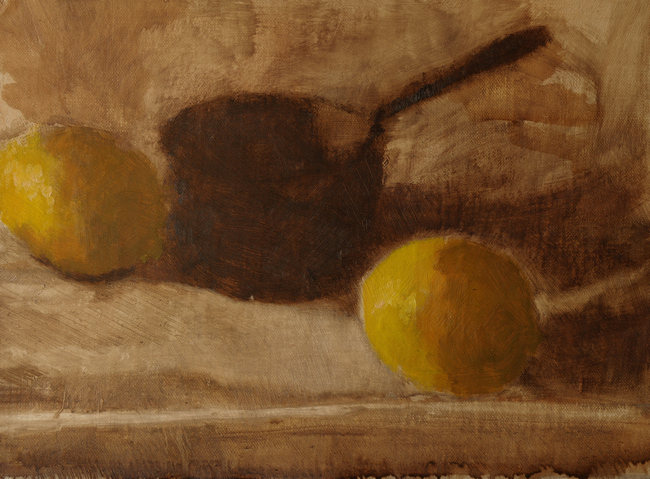 Blogging my way through a few paintings might just end up showing you the best way to mess up. My bright idea for this series was to use a pochade box as a display platform. The lighting looked best for this particular scene when it was placed next to the window with the studio overheads turned off. My studio is rather dark without artificial light, but I can get by if the day isn't too overcast. 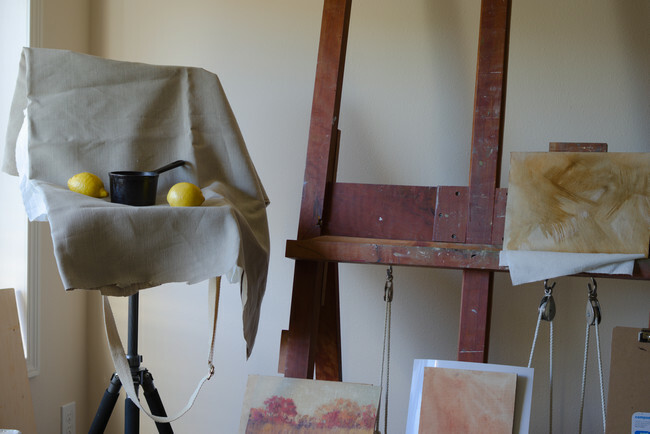 My canvas is to the right and my palette is located just to the left of the tripod. It's not a perfect arrangement because I have to make like a contortionist in order to mix paint then turn back to my easel, but at least everything is close at hand. 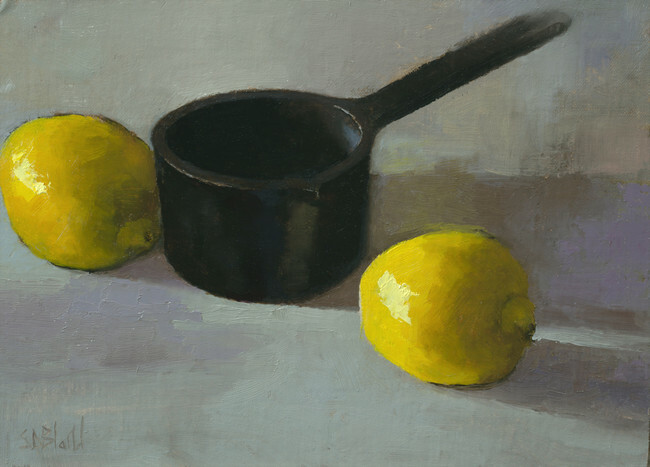 I used an old cast iron melting pan as the center piece because it looked challenging to paint. 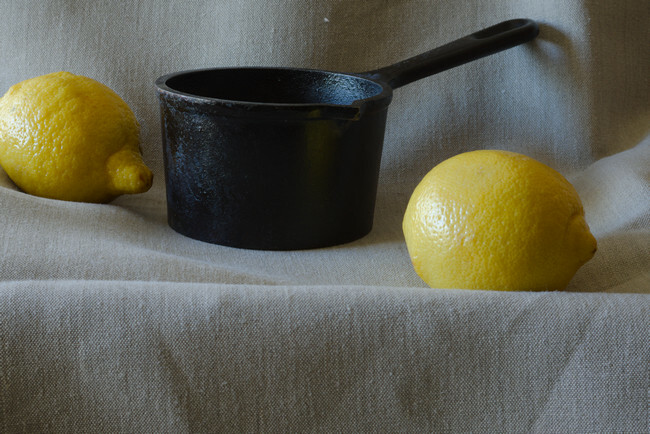 Against that, the lemons provide color and value contrast and set up a complex relationship between their shape and the elliptical appearance of the inside of the pot vs. the pincushion shape of the outside. I spread everything out on some raw linen to help unify the scene. After that, I moved the objects around to find an arrangement that I liked. After that I spent an hour or so getting the basic composition down on the canvas using a massing-in approach. The benefit of starting this way is that I immediately have to think about the picture in terms of big light and dark shapes. I never feel like I'm painting-by-numbers. I will have to work on the drawing throughout but doing it this way actually makes painting easier, not harder. Although the initial plan was to toy around with this for a few days, I made good progress and got everything down in one long session. The only problem is that I got into the thick paint too quickly and used raw umber in all the background areas to boot. My plan to develop this as a multi-layer painting with lots of color variation fell apart. All is not lost, however. The painting's actually OK—no drawing errors that can't be corrected—and the design is strong. I can just do some tidying up and move on. Milk Pan. 9x12, oil on hemp panel. 2018. The finishing touches are hard to see—a small amount of refinement on the form of the pan and some tightening up of the nooks and crannies in the background area. I decided not to work the painting further. It's reached a good state of completion and any adjustments are more likely to ruin it than make it better.